AUDNZD finally broke out of its sideways trend overnight, before traders in Asia further crippled the pair. 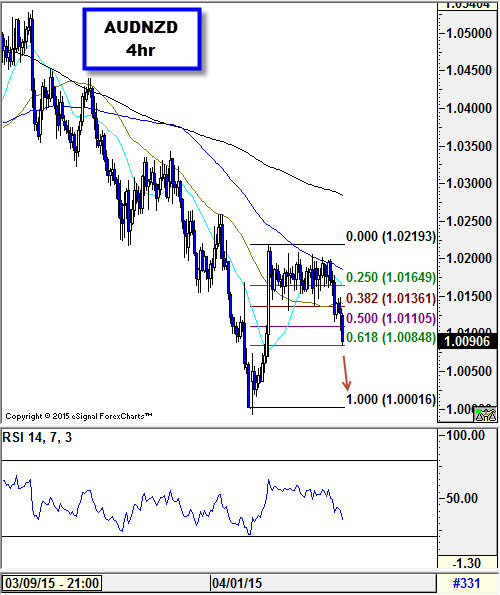 At the end of last week we postulated that AUDNZD couldn’t hold on forever due to a continuing divergence between the fundamental underpinnings of each pair. Weak economic data out of Australia and China and general lack of optimism about the aussie finally proved too much for the ultimate commodity pairing, with it now testing its 61.8% retracement level from its recent push towards parity. A break here could spark a push towards that all-important support zone around 1.0000. Interestingly, a slew of economic data from China dealt the biggest blow to AUDNZD. Clearly the aussie is more vulnerable to any indication that Chinese demand for commodities may soften even further, which is understandable given that NZ’s exports are more resilient to these kind of shocks to economic growth in the world’s second largest economy. Also, the figures this time around are especially concerning for iron ore producers. Retail sales, industrial production and growth figures were released today with mixed results. The growth numbers for Q1 were in line with expectations at 7.0%, but the rest of the numbers completely missed expectations. Retail sales and industrial production only increased 10.2% y/y and 5.6% y/y in March respectively, missing expected increases of 10.9% and 7.0% respectively. Combined with Monday’s soft trade numbers, today’s data doesn’t paint of rosy picture of China’s economy at the beginning of Q2. The figures that really hit the Australian dollar were a collapse in the amount of land sold over the first quarter and an increase in the stockpile of new homes, as well a mild slowdown in fixed asset investments. The amount of land sold in Q1 was down 32.4% from Q4 and the numbers of homes yet to be sold jumped 24.6% over the same period. Both indicators suggest that China’s demand for iron ore is deteriorating even further – residential property accounts for around 20% of this demand – due to massive oversupply, which is bad news for the iron-backed Australian dollar. If this wasn’t bad enough, figures out of Australia earlier in the session showed a marked drop in consumer confidence this month. Westpac’s Consumer Confidence Index dropped 3.2% in April to 96.2, its lowest level since January. This means that the Australian dollar was hit from lack of confidence from domestic economy and softening demand from overseas for Australian products, which is strong one-two combination against an already fragile currency. In the past 24 hours Bitcoin has lost -0.41% and reached $5288.26853142. Open your trading account with the best cryptocurrency brokers on special terms today.